Previously, scores of FBC members participated in a six week Daniel Plan program. The feedback about the program was positive and many have inquired if there were plans to do it again. Several participants also went to a reunion event last fall hosted by the Cleveland Clinic Center for Functional Medicine. We were excited to hear directly from Dr. Mark Hyman and learn that the Clinic wanted to continue their support. 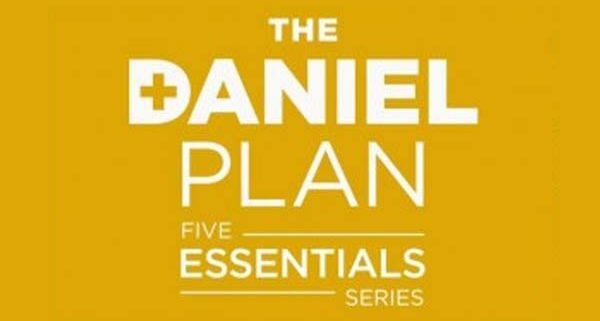 You are invited to continue or begin your journey toward better health through The Daniel Plan Five Essentials Series. The Daniel Plan Essential Series contains all new materials that will equip you to develop new healthy habits that will bring hope and healing to every area of your life. You will take a deeper dive into all the principles that frame The Essentials: Faith, Food, Fitness, Focus, and Friends-life areas that all work together to restore your health for the long run. For more information or to RSVP contact Jane through the form below. This spring we are bringing back the Bell Choir, one of Bob Schneider’s favorite music-making ensembles here at First Baptist! But we can’t do bell ringing justice without bell ringers. 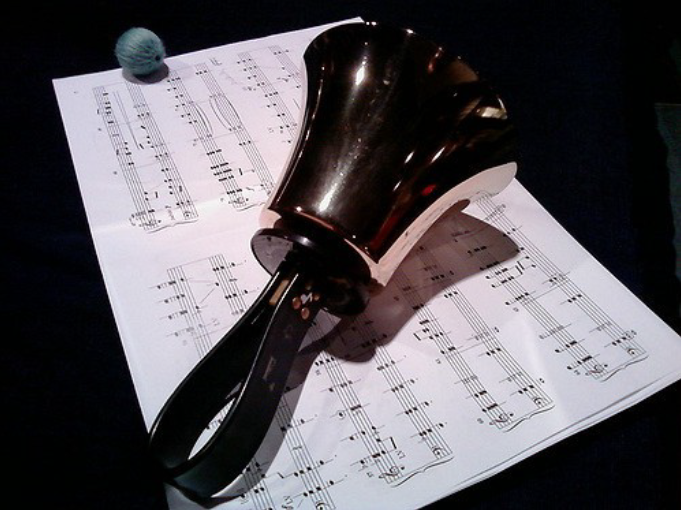 For a variety of reasons the ranks of the Bell Choir have been reduced, so we are looking for dedicated individuals, preferably who can read music (although there are wonderful bell ringers who don’t read music) and who could dedicate time for a one hour rehearsal from 6 to 7 PM each Thursday evening, and perform in a Traditional Worship Service about once a month. We have moved the rehearsals and performances downstairs from the balcony in the back of the Sanctuary, so if climbing stairs have been holding you back, that excuse is gone! Rehearsals, with a very congenial group of ringers, are enjoyable to be with, to say the least. So give joining the Bell Choir some thought. In fact, don’t even think about it. Just come on out on a Thursday evening at 6 PM and give it a try. The 100th Psalm says in part, “Make a joyful noise unto the Lord, all ye lands!” That would be YOU playing bells! Give it a try. You won’t regret it! 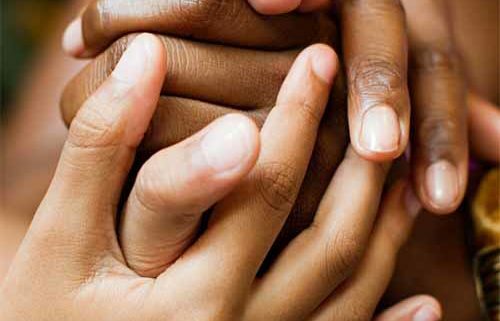 Stephen Ministers are First Baptist Church members who have received special training to provide individual Christian care to those who are experiencing life challenges such as death, grief, divorce, job loss, etc. Stephen Ministers have been serving in this caring mission at First Baptist Church since 2002. Stephen Ministry is confidential and free. Stephen Ministries is an independent, not-for-profit Christian educational organization founded in 1975 in St. Louis, Missouri. It is named after the disciple Stephen (Acts 6) who was chosen to provide caring ministry to those in need. For more information on Stephen Ministries please visit their website at stephenministries.org or pbs.org/wnet/religionandethics. 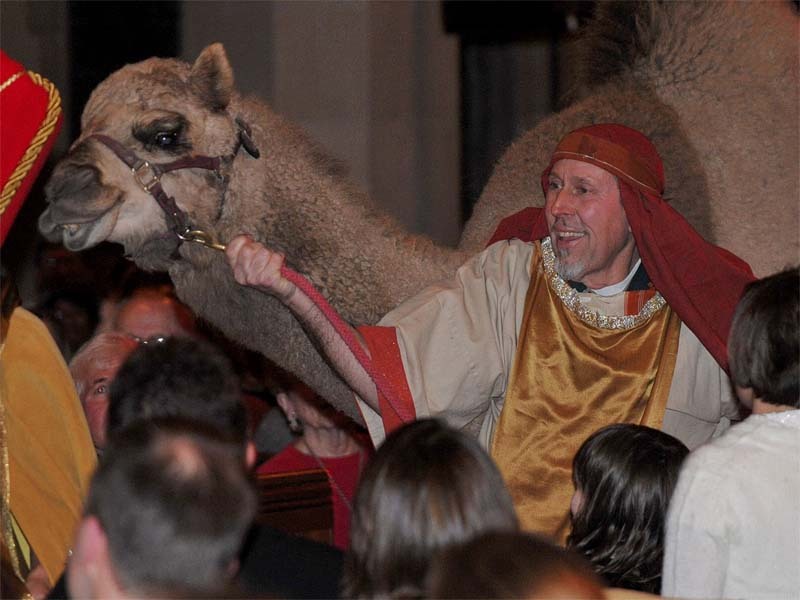 Stephen Ministers are Greeters at both Contemporary and Traditional Services every second Sunday. It’s a great time to ask them any questions and get to know your Stephen Ministers. If you need help or would like more information about the Stephen Minstry, fill out the form below. 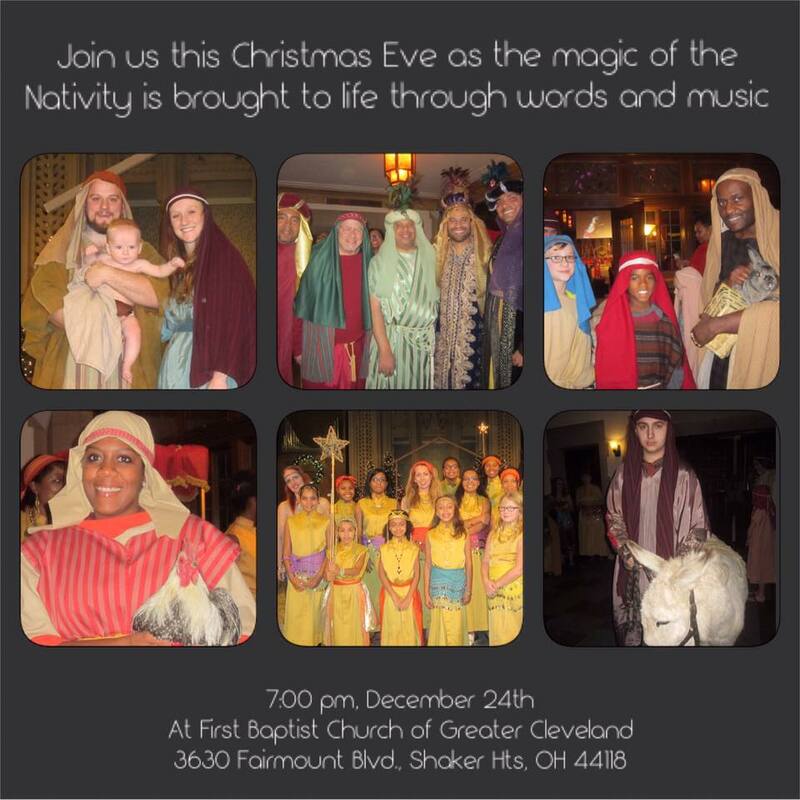 One of First Baptist Church’s most beloved annual traditions, our living nativity brings to life the Christmas story into our sanctuary with a large host of live animals, choirs, soloists, musicians and the newborn baby Jesus. 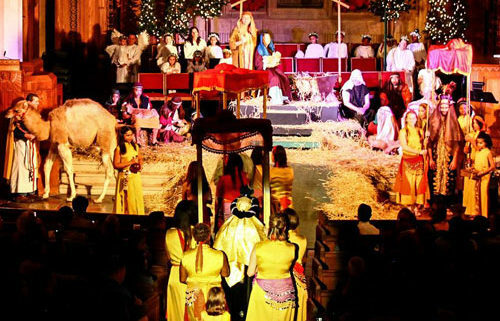 The church fills up as we celebrate with traditional hymns and new selections of music, as we participate together in the celebration of the birth of Jesus. Several times a year the Cleveland Life Institute sponsors leaders to come and speak to the community about their experiences and training. His talk about “Social Responsibility in the 21st Century-a Call to a New Generation” was very informative and the large crowd appreciated his wisdom. Theologian, pastor, and civic leader the Reverend Dr. Otis Moss, Jr. is one of America’s most influential religious leaders and highly sought-after public speakers. 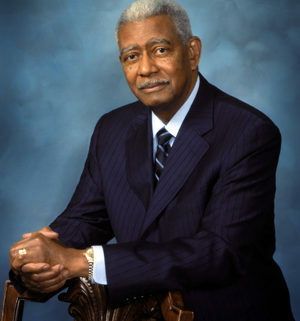 A native of Georgia, Dr. Moss was born on February 26, 1935, and was raised in the community of LaGrange. The son of Magnolia Moss and Otis Moss, Sr., and the fourth of their five children, he earned his B.A. degree from Morehouse College in 1956 and his masters of divinity degree from the Morehouse School of Religion/Interdenominational Theological Center in 1959. He also completed special studies at the Inter-Denominational Theological Center from 1960 to 1961 and earned his D.Min. degree from the United Theological Seminary in 1990. From 1954 to 1959, Dr. Moss served as pastor of the Mount Olive Baptist Church in LaGrange, Georgia. From 1956 to 1961, he also served as pastor of Atlanta’s Providence Baptist Church and therefore, simultaneously led two congregations from 1956 to 1959. From 1961 to 1975, he pastored the Mount Zion Baptist Church in Lockland, Ohio, and in 1971, he served as co-pastor, with Rev. Dr. Martin Luther King, Sr., at Ebenezer Baptist Church in Atlanta. In 1975, he was called to pastor Olivet Institutional Baptist Church in Cleveland, Ohio, He led the church for 33 years before retiring in 2008. In 1997 Moss partnered with University Hospitals to create the Otis Moss Jr. Medical Center. Dr. Moss has been involved in advocating civil and human rights and social justice issues for most of his adult life. Having been a staff member of Rev. Dr. Martin Luther King, Jr., he currently serves as a national board member and trustee for the Martin Luther King, Jr. Center for Non-Violent Social Change. His work in the international community has taken him to Hong Kong, Taiwan, and Japan as a member of a clergy mission in 1970, and to Israel in 1978. In 1994, he was the special guest of President Bill Clinton at the peace treaty signing between Israel and Jordan, and, in that same year, he led a special mission to South Africa. Dr. Moss is the recipient of numerous awards and honors, including Human Relations Award from Bethune Cookman College in 1976, The Role Model of the Year Award from the National Institute for Responsible Fatherhood and Family Development in 1992, Leadership Award from the Cleveland chapter of the American Jewish Committee in 1996, and an Honorary Doctor of Divinity from LaGrange College in 2004. In 2004, he participated in the Oxford Round Table in Oxford, England, and was a guest presenter for the Lyman Beecher Lecture series at Yale University. Reverend Otis Moss is the Chairman of Morehouse College. He is the Director of The Cleveland Foundation. Named by Ebony magazine as one of America’s greatest black preachers, he has been involved in the civil rights movement for more than 35 years. A founding board member of the Greater Cleveland Roundtable. This free presentation by was sponsored by the Cleveland Life Institute. Guest speaker, Jim Rokakis – former Cuyahoga County Treasurer and current Vice President & Director of Thriving Communities of the Western Reserve Land Conservancy spoke about “Abandoned Housing in Cleveland” . The slides showed the true story of the monster that ate Cleveland and the surrounding suburbs. It clearly showed Cleveland’s vacancy crisis as it expanded to swallow up neighborhood after neighborhood. 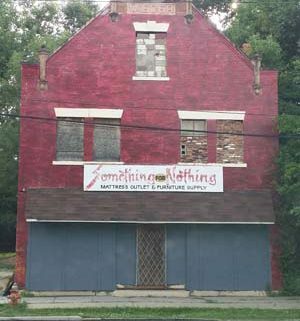 With the loss of population, the weakened economy, the housing bust, and foreclosures there are hundreds if not thousands of houses that are in bad shape or sitting empty in the city of Cleveland. Perhaps half of these houses are in bad enough shape that they are beyond saving from demolition. This is a very location driven problem. Some neighborhoods are affected more than others. It is easy to say this is an inner city problem since homes in outer-ring suburbs get purchased, rehabilitated and placed back on the market quickly. Our program is designed to challenge your current perceptions about leadership and the values through interaction in our group both in the classroom as well as making a difference in our community project right here in Cleveland Ohio. The Cleveland Life Institute is a faith-based residential executive education program that offers the opportunity to think strategically about guiding organizations to be relevant to culture and relational to the community. The two-semester program “Skills for Social Entrepreneurs” is the first course to be offered by the School. A letter of recommendation for the program. Space is limited, please apply as soon as possible.